Sit down to your next crab feast with no worry! A staple at seafood event serving hardshell crabs, lobster, crab legs this eye-catching table cover features a festive red trim and graphic crab print for a timeless look that's sure to please! It's made of standard brown kraft paper that will provide you with a quick, clean, and disposable eating surface without the fuss of laundering cloth table covers. This 40" x 9' table cover is the ideal mood-setter for crab feasts, seafood buffets, low country boil, and catered events. Use it at your outdoor eatery for an inexpensive table covering, or use it to cover tables indoors for a bright bold look. Thanks to the wide, 40" width, this table cover is designed to fit most standard tables. 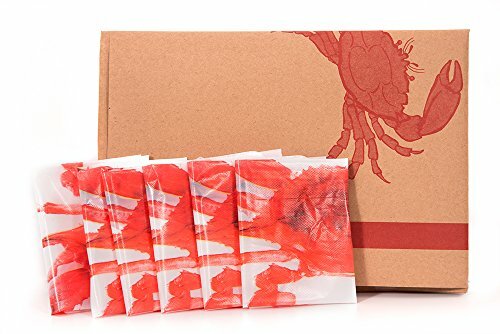 Also included is 6 disposable crab bibs. The food may be messy, but your clothes stay clean! Check out other great seafood tools by EZ-Sheller on Amazon! The food may be messy, but your clothes stay clean! View More In Disposable Apparel. If you have any questions about this product by EZ-Sheller, contact us by completing and submitting the form below. If you are looking for a specif part number, please include it with your message.